Don’t be so presumptuous young lady. That thought was what I was really thinking during the opening moments of “Louder Than Words,” as a 13-year-old girl with a Medusa-like explosion of dark curls and a preternaturally smugger-than-thou smile rides her bike on an impossibly sunshine-drenched day . Best get used to Maria (Olivia Steele-Falconer) as she persists in narrating this truth-based tale that would barely cut it on the Hallmark Channel. Prepare for her to materialize in flashbacks even after she tragically expires from a rare case of bat rabies. She is like an irksome version of Clarence the angel from “It’s a Wonderful Life.” Except, in this case, it is more like it’s a wonderful death. One that inspires her high-strung New England family, whose torturous taste in taupe-heavy décor practically shouts dysfunction, to build what I am sure is a terrific children’s hospital in Maria’s memory. Not that “Louder Than Words”–they are taking action, get it?–much cares about allowing us to share in the joy of sick kids and their loved ones benefiting from this state-of-the-art pediatric facility in Valhalla, N.Y. The end results are relegated to a smattering of sketches and snapshots along with assorted captions over the end credits. Instead of closure, we are urged to instead focus on the over-privileged Fareri family, who–at least in this film’s incarnation–makes the distraught upper-class clan in “Ordinary People” seem like the Waltons. Let’s make one thing clear right here. I am not normally a cynic and I abhor the impersonal, drab and cramped confines of many health-care facilities as much as anyone. And that the tragic loss of a child bettered the world in some way is fine with me. 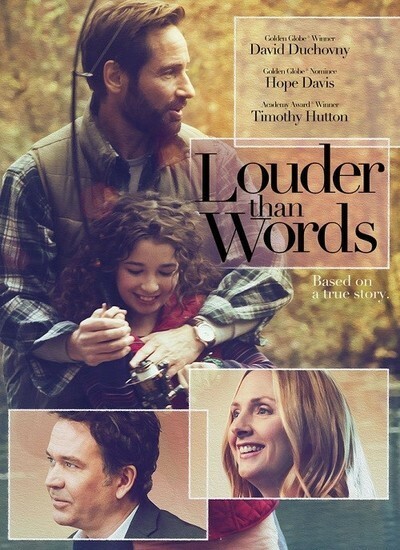 But instead of celebrating that accomplishment, “Louder Than Words” goes out of its way, and almost takes pride in, eschewing actual heartfelt emotions–so much so that, by the end, it is hard to even care. Shots of pretty autumnal leaves, sometimes dripping with tear-like raindrops, and other fancy camera tricks do little to fill in the blanks. In other words, this is no “Lorenzo’s Oil,” a superior reality-based drama from 1992 about another family who challenged the accepted norms of the medical community. Instead, we have David Duchovny, one of the least-emotive actors ever, typecast as John Fareri, a man who builds a wall around his thoughts and feelings. This commercial developer who revels in always getting his way (there is a snide comment at one point about how he likes to steamroll over the concerns of environmentalists) is an enigma to his indulgent business-partner and decorator wife, Brenda (Hope Davis, a fine actress saddled with a hopeless role), as well as to his two college-age daughters and only son, who happen to be triplets. But not to Maria, for she is the self-declared glue who holds them all together and a child of wonder who illuminates her father’s universe. He willingly reveals to his favorite child the very principle that guides his life and work: “It’s easier to ask for forgiveness than permission.” Translation: “I will do whatever I want and apologize later.“ Nice guy, that John. OK then. By the time a half-hour or so ticks by, our heroine–who, while annoyingly precocious, has more of a pulse than any of the other performers onscreen–has already met her demise. But not before, in a series of disjointed scenes, she shows off her outgoing personality by singing a little ditty with her pals, confessing she has a crush on a boy and joking around with her father, who barely ever acknowledges his other offspring, while fishing together on a two-person camping trip. The very outing, apparently, that led to her being exposed to the fatal disease. Now grief-stricken, the rest of the family drifts farther apart. Dad becomes more of a non-presence than ever while Mom goes on mad cleaning sprees. The moody daughter runs off to Seattle with her boyfriend. And, at a Boston college, the scholarly daughter finds refuge in her school work while her brother skips his classes and mopes. At least the siblings share one bond: chain-smoking. When a zombie-esque Duchovny isn’t busy staring off into space, his John is making haphazard attempts to allow Maria’s dream to come true by coming up with a hospital plan. He brings in a specialist (Timothy Hutton, who at least provides a smile or two) but fails to include or even inform his wife of his efforts. Eventually, plates are smashed, voices are raised and the healing begins. As for the project, after several hurdles such as recruiting members of their well-off community as donors, John and Brenda succeed with what seems like an average amount of handwringing to make the proposal a reality–despite the fact it actually took nine years to complete.